While most music lovers are familiar with the famous scores of Tchaikovsky, Delibes, and Stravinsky, many other lesser-known composers also wrote for the ballet. Several of these composers wrote almost exclusively for the ballet--and all enriched the world of dance. Minor Ballet Composers presents biographical sketches of 66 underappreciated ballet composers of the 19th and 20th centuries from around the world, along with selected stories from the ballets they helped create. Minor Ballet Composers emphasizes the importance of second-tier composers and their influence on the rich tradition of music written for the dance (though in some cases the music was appropriated for the ballet from other original designs). 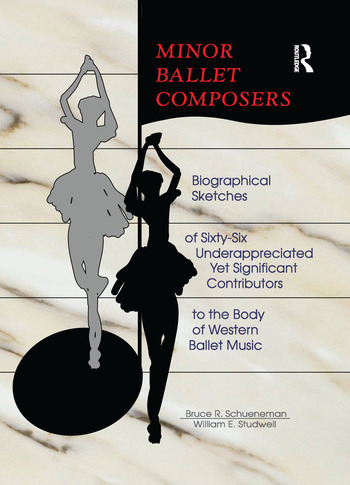 The gathering of these composers in a single volume in appreciation of their ballet music, with a glossary of choreographers and an index of ballet titles, makes this book a useful volume for ballet aficionados, music librarians, musicians, and others interested in dance and dance music.